Floor-to-ceiling glass windows wrap around a sleek interior of red and black. Waves of natural wood cover the entire ceiling. A lone painting of Atlanta's skyline adorns one of the walls. Designed under the Japanese minimalist principal of Ma, the space is uncluttered, the lines clean. This is CO, meaning "feast" in Vietnamese, the latest modern pan-Asian restaurant to arrive in Atlanta. Located on the ground level of the new Poncey-Highland mixed-use apartment complex near the corner of Highland and Ponce, CO mirrors many of its new neighbors (like Rize Artisan Pizza + Salad, which opened late last year) in that it's designed to multiply. The owner, Gregory Bauer, is a German-born U.S. Marine Corps veteran. While stationed in Southeast Asia on and off for three years, he says, he fell in love with the local flavors. After returning to the states, he got his MBA, then took a few months off to snowboard and do yoga, contemplating his next career move. In the end, Bauer decided what he most wanted to do was share the flavors and cultures he encountered during his travels. He opened the first CO restaurant in Charleston, South Carolina in 2012 and has organically grown the business ever since, tapping into the same discipline and dedication that got him through his military service. No value assignedThe plan has worked. Atlanta is Bauer's fifth CO location and two more are scheduled to open this year. "I was ready to take my concept to the big city," he says about launching the newest restaurant in Virginia-Highland, where he appreciates the fact that people can walk up for a casual meal. Like Bauer's travels, the menu spans the Asian continent. Original recipes were developed with the help of Vietnamese caterers in South Carolina. Later, Masatoshi Tsujimura, a Japanese sushi chef and restaurant owner in Raleigh, came onboard as executive chef. Today, "Chef Masa?۝, as he is known, oversees all CO restaurants. The CO team hopes to provide an easy entry point to Asian flavors, one that won't overwhelm the typical American palate (or your picky kids). You won't find bean curd puffs or tripe here; instead, strong flavors and unfamiliar textures are replaced by approachable ingredients like chicken and tofu. LUNCH WITH A VIEW: Two customers enjoy a meal in CO's airy dining room.Joeff DavisAppetizers include edamame gyoza ($5) a vegan-friendly blend of crunchy mashed edamame stuffed into fluffy steamed and pan-fried dumplings, and served with sweet ginger soy sauce for dipping. The salmon carpaccio ($13) is sliced a bit thick, but the fish is fresh, dressed in lemongrass zest and micro greens for a lovely summer flavor. Tuna tacos ($8) offer two soft flour tacos packed with diced tuna and avocado. Garlic, jalape̱os and cilantro add balanced kick to the dish. There's also bahn mi! Try the marinated and grilled lemongrass tofu ($8) served on a crisp rice flour baguette. 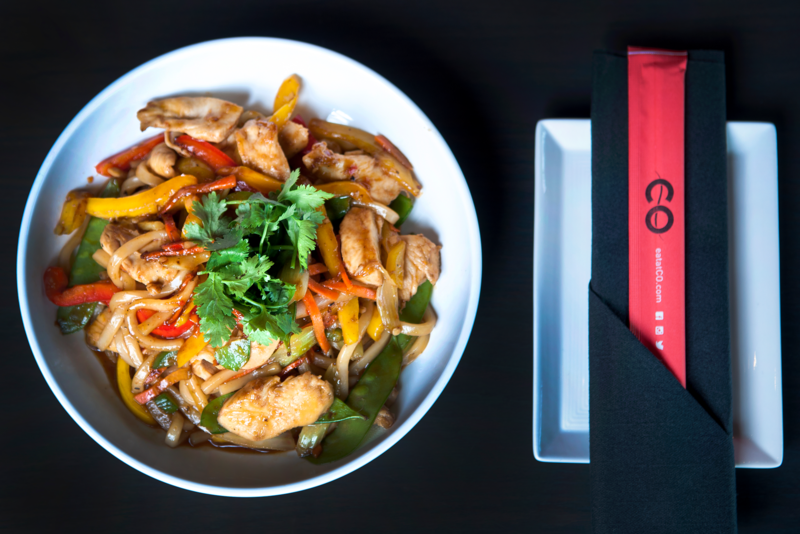 Wok dishes offer Chinese, Thai, Korean and Japanese-inspired combinations. Thai green curry ($14) resembles what you'll find at most Atlanta Thai restaurants, but here there's white wine in the sauce, making it thinner than most coconut-based curries. Those who appreciate a bit of heat should opt for spicy udon ($14), a colorful medley of veggies stir-fried with thick Japanese wheat noodles, spicy black pepper sauce and the protein of your choice. Or, to kick up any dish, add some of the restaurant's signature hot sauce, made in-house by deep frying red peppers and grinding them with onions, garlic, shallots and lime juice. While stationed in Okinawa, Japan, Bauer developed a fondness for oshizushi (pressed sushi), and CO is one of the few places in Atlanta that makes it. Sliced salmon ($13) is pressed onto rice in a wooden box, resulting in rectangular cuts of sushi, then topped with ripe avocado and a creamy lemon aioli. Each piece is enormous, so go ahead, forgo the chopsticks and use your fingers to pick it up nobody's at CO to judge. The spring geisha roll with seared salmon ($14.5) and kobe jalape̱o ($15) are other fun, fusion-y creations for those who prefer their proteins cooked. At the newly opened bar, you'll find a traditional sake selection as well as fruit and herb infusions made in-house. There's also an array of signature cocktails (blackberry bourbon fizz, anyone?) and a whole menu section for boba tea, with toppings that range from lychee jelly to bursting passion fruit pearls. While CO may not impress die-hard foodies (as in, those who will gladly trek to Buford Highway in search of the best pho or dumplings), it's a pleasant and accessible spot to take the whole family and expose picky eaters to new flavors. Add in the convenient location, sleek ambiance and well-stocked bar, and you just might have your favorite new neighborhood noodle and sushi joint. CO, 675 North Highland Ave., 404-474-0262, www.eatatco.com.